Got Sen'jin Fetish from it. Funny thing is, there were only 2 items on the BMAH that day: this container and precisely another Sen'jin Fetish. Talk about a coincidence (I wouldn't assume this happens often)! Just got Robe of Faith from box on Arygos (5/25/2013) 30k... not well spent. I have a feeling this will become the Mysterious Fortune Card of Mists, only a WAY bigger gold sink. I still can't help trying it once though. Ill report back with my findings. I purchased one of these on 5/25/2013 and received Tyrannical Gladiator's Ring of Cruelty I am a dk and have no use for this. I just bought one for 19k and i got Pattern: Murderer's Gloves. Not the best but at least I can send it to my LW and in theory I can make my money back and maybe even more. Im still never paying over 10k for a container again. Contained Invincible's Reins. Which I would be 100% thrilled and squealing with joy about...except I already did a while ago. I've now got two of them. Got it for 55k in the end after an epic bid war, it contained Dreadnaught Pauldrons. Cant believe it vendored for a whooping 4g 88s 30c so thats pretty sweet!.oh I guess I forgot to mention that I'm a priest. Gambling can pay of big! I won a container last night on US-Andorhal for roughly 33k… I went to mailbox and clicked to open it and BAM! Invincible's Reins I actually did a double take because I was expecting some piece of T3 cloth gear for my DK. Dreams can come true. I just looted Reins of the Plagued Proto-Drake from my first Unclaimed Black Market Container. I almost fell out of my seat since I've wanted this mount since WotLK, but didn't complete the Nax achievements in time. Also, I didn't think I'd get a chance to buy it off the black market since it is so sought after and would likely be out of my price range on the black market (e.g. Invincible's Reins went for a whopping 999,999g on my realm and that's for a farmable mount!). In my first box which I payed 29k I got Talisman of Angry Spirits. Which payed of very nicely cause I'm ret paladin and this is my BiS neck. Second box I bought for 19k and got Spurs of the Storm Cavalry. I just purchased my first Unclaimed Black Market Container for just over 15k and received Links of the Disintegrator! Great luck for my first buy since I am a SV Hunter! The first I bought for 29k a few weeks back and contained Dreamwalker Boots. They were bought on a hunter, unfortunately. The second, which I bought last night, I bought for 45k. This one has allowed me to confirm that X-51 Nether-Rocket X-TREME does indeed have a chance to come from the box as well. In addition to receiving X-51 Nether-Rocket X-TREME, there is something else I would like to point out. X-51 Nether-Rocket X-TREME is one of the TCG mounts that can be posted on the AH. Despite receiving it through the BMAH instead of TCG, I would like to confirm that it is indeed still able to be posted on the AH should you choose to do so. The good news is, I bid 9350g, won, and got Reins of the Blue Drake. So, I cancelled my sub about a week ago and had a bit of pre-paid playing time left so I thought, what the hell, blow all the cash on these things and see what I can get. First one cost me 7500g from which I pulled Invincible's Reins... 6 days of sub time left... way to reel me right back in blizz. Received Bonescythe Gauntlets. Ragemode engaged. Last week a guildie of mine looted Reins of the Plagued Proto-Drake from the box, so I was kicking myself for not buying it. The next day I got Reins of the Drake of the South Wind, which surprisingly I hadn't had yet (from al'akir), so I guess it was worth the 10k. Decided to go after another Unclaimed Black Market Container tonight, after a long hiatus due to my last experience with one...one in which I payed 15k for a piece of armor I couldn't use, and was for horde side. It's a gamble, that's for sure! 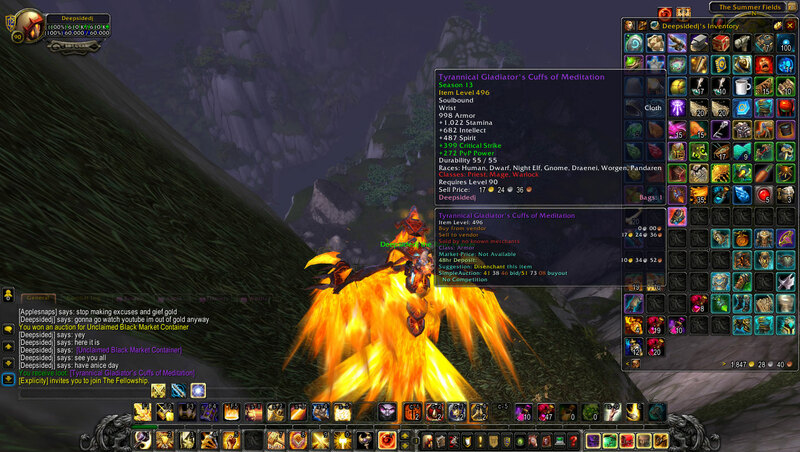 Tonight's container I payed 5,510g for it, and looted Reins of the Drake of the North Wind. On the bright side, it's not junk and its a mount. On the other hand, I already have it. However, I can confirm this mount drops from these containers. I hadn't seen it listed in the loot before. So, it's good to know other unlisted mounts can be in these containers. The new version of this item that was added in Patch 5.4 is Unclaimed Black Market Container. I love the Proto Drake and have seen them go for over 350k on the BMAH so I like to think I'm currently ahead of the game after spending roughly 112k. Still grinding for Invincible's Reins which is really what I'm after. Bought 2 so far, First one at 29,9k Gold contained a Flametalon of Alysrazor and my second one at 69k Gold contained a Reins of the Green Proto-Drake , hoping that one day something alittle bit more rare comes along, keep on gambling. I suspect most people, myself included, buy these boxes in the hope that it contains a cool mount like Mimiron's Head or Invincible's Reins. So, I spent 21,000g on the container and ended up winning 18gold 19silver 13copper. It's the exact amount that a vendor will pay you for Grievous Gladiator's Cuffs of Prowess ... This purchase is going into my "Remember That One Time?" memory bank. Fly to Telaari Station (Its a straight shot from your garrision) and use Aviana's Feather. Just bought one in Gallywix for 12.6k and got a Razoredge Blade Ring, mythic version. I decided to try my luck and bought one the other day for 11.5k. Expecting to get outbid I was pleasantly surprised when I found out that I had won and about had a heart attack when I opened it and was greeted by a Smoldering Egg of Millagazor. Bought one of these today, for 51k. Opened it and got a Razzashi Hatchling. They sell currently for ~850g. The last one was 10 minutes ago, and now my New Years Resolution is to stop buying these things. I paid 51k for Choker of Whispered Promises. On my warrior. Today I noticed an Unclaimed Black Market Container quite cheap on my realm, which rarely happens and probably due to a lot of players doing the new patch content, so thought I would put a bid in - I promised I wouldn't spend more than 160k as I am frugal! I had to go offline, came back to find an Unclaimed Black Market Container in my mailbox, I was so excited with it being my first ever box and getting it for a steal of a price (for my realm atleast). I knew chances were it would be junk, so I never got my I never got my hopes up. "An item sold at a previous auction that was never picked up by the winning bidder. Buyer beware." Comments posted solely with information as to how much you paid and what was received are likely to be voted down by other users.